For the second time in the past three years, The New York Racing Association, Inc. (NYRA) set a record for all-sources wagering on racing at Saratoga, concluding the 2017 Saratoga meet with a handle of $676,709,490. The 2017 handle eclipsed the previous high set in 2015 by 4.4 percent and shattered the prior record set in 2012 by more than 15 percent. 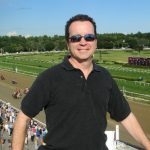 The 4.4 percent increase in wagering from all sources included $157,014,965 in on-track handle, a 3.4 percent increase over last season, which incorporates live pari-mutuel wagering at Saratoga Race Course, at NYRA’s downstate tracks and New York State residents who wager through NYRA Bets. Additionally, the $47,870,987 in handle generated on Travers Day marked the second highest handle in history for Saratoga’s premier day of racing, an increase of five percent over 2016. The 40-day meet included 69 stakes worth $18.775 million in purses. Michael Dubb made it four straight titles as the meet’s leading owner with 15 wins. Todd Pletcher captured the H. Allen Jerkens training title, tying the Spa record for wins with 40 victories. Jockey Jose Ortiz earned back-to-back Angelo Cordero, Jr. titles as the meet’s top rider with 58 wins. The greatest thoroughbreds in training assembled at Saratoga Race Course on Travers Day, including for the first time in 35 years the three winners from the Triple Crown series and the Jim Dandy, plus champion filly Songbird and the resilient Lady Eli. The festive and memorable afternoon was highlighted by West Coast’s wire to wire victory in the 148th edition of the Travers Stakes, presented by NYRA Bets, for owners Gary and Mary West, and for the trainer-jockey combo of Bob Baffert and Mike Smith who captured Saratoga’s signature race for the second consecutive year. Gun Runner, the top ranked horse in the nation, began his Saratoga campaign with an impressive five-length win in the 90th anniversary of the Whitney Stakes, and then returned to action on the meet’s closing weekend to dominate the Woodward Stakes, presented by NYRA Bets, with a more than 10-length victory. Launched in conjunction with NYRA Bets last summer was NYRA’s critically-acclaimed flagship racing broadcast Saratoga Live. As a result of additional distribution agreements with FOX Regional Sports Networks in southern California and Ohio, Saratoga Live expanded its reach this summer into more than 75 million households, including new audiences in Los Angeles, San Diego, Ohio and Kentucky. During the 2017 meet, NYRA and FOX Sports announced a three-year extension of the groundbreaking television programing deal, which will make live daily coverage of racing from Saratoga available on FS2 to a national audience through 2020. This year’s broadcast also highlighted local area attractions, including the National Museum of Racing and Hall of Fame, Saratoga Performing Arts Center, and the shops and restaurants along Broadway to a national audience in an effort to promote tourism in conjunction with racing, and create a national showcase for Saratoga Springs. In addition to coverage on major national and regional sports networks, horseplayers were able to watch Saratoga Live and wager with NYRA Bets through NYRA’s two mobile applications: NYRA Now and NYRA XP, the latter of which made its highly successful debut during the 2017 season. More than 16,000 guests in 114 cities and across 25 countries downloaded NYRA XP during the Saratoga meet. The app integrates seamlessly with both NYRA Now and NYRA Bets – enabling fans to watch live racing in high definition; wager through NYRA Bets; and purchase tickets, parking, food and merchandise at the click of a button. Fans for the first time were also able to utilize the app to reserve a ride with Uber, the official ridesharing partner of Saratoga Race Course. NYRA’s mobile applications were strengthened by significant investments in technology to enhance the guest experience at Saratoga. By increasing the on-track Wi-Fi capacity by 250 percent, fans enjoyed heightened connectivity throughout the meet. On Travers Day alone, more than 44,000 mobile devices were connected to the track’s wireless network. At any one time, approximately 12,000 mobile devices – or one out of every four – were concurrently connected to the Wi-Fi network, a noted high ratio for sports venues. NYRA’s investment in capital improvements at Saratoga dating back to 2013 eclipsed $30 million this summer, in efforts continuously designed to enhance the guest experience and provide amenities that are consistent with those available at “first class” sports franchises. At the start of the 2017 meet, NYRA introduced the newly-renovated Saratoga Family Zone, a smoke- and alcohol-free interactive play area with an oval multi-lane running track, a miniature replica starting gate, a “selfie” photo station, spring horses and educational panels designed to teach children about the life of a race horse. The improvements to the playground are viewed as critical to the long-term sustainability of Saratoga Race Course by offering families an enticing option for their children when visiting Saratoga, thereby laying the groundwork for future generations of racing fans. NYRA also unveiled several upgrades to the historic paddock mutuel building, including a new slate roof and rafters. The improvements are intended to ensure the continued preservation of the historically-significant building, which was constructed in 1902 and originally used as a saddling shed during inclement weather. In addition to enhancements throughout the venue, fans were treated to a series of special events and activities throughout the meet. An annual highlight of the Saratoga racing season returned on the eve of the Travers when three-time Eclipse Award-winning jockey Ramon Dominguez was welcomed to the Saratoga Walk of Fame at the fifth annual Red Jacket Ceremony, during which Dominguez received an emblematic Saratoga red jacket and unveiled his commemorative plaque. The plaque is displayed at the Walk of Fame which honors industry leaders who have made an indelible mark on thoroughbred racing. The Red Jacket Ceremony was among the many special events during the season, the vast majority of which were staged at the Berkshire Bank Saratoga Pavilion. The Pavilion played host to a weekly series of events for families every Monday; and hosted New York wineries every Thursday, New York craft breweries every Friday and New York foods and crafts each weekend, in partnership with the New York State Department of Agriculture and Markets’ Taste NY program. Wednesdays at Saratoga were reserved for popular mainstays celebrating Irish- and Italian-American culture as well as the annual Military Appreciation Day, which honored dozens of service members from World War II through the present era. NYRA welcomed more than 40 local and regional non-profit organizations, schools and PTAs to Saratoga Race Course. The majority of the non-profits enjoyed an exclusive day at the Community Outreach Booth to help further their marketing, outreach and fundraising efforts, while local schools and PTAs took part in the Berkshire Bank Family Mondays series to raise funds and reconnect with fellow students and parents. NYRA also continued its community partnership with the Saratoga Downtown Business Association through the Saratoga Season Perks program. The program includes discounts for Saratoga season pass and season ticket holders at dozens of retail, restaurant and professional services locations in downtown Saratoga Springs, as well as with local entertainment and sporting venues. 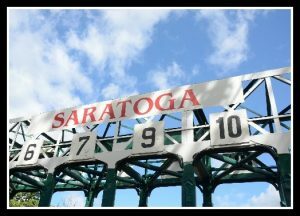 A full list of the year-round program participants is available at www.SaratogaSeasonPerks.com. The discount offer is valid through March 1, 2018. NYRA also formed several partnerships with the City of Saratoga Springs, the Capital District Transportation Authority, and local hotels, restaurants and bars to help familiarize tourists and the community with the growth and expansion of the NYRA Bets brand. Total paid attendance for the 2017 Saratoga meet was 1,117,838. Live racing returns Friday, September 8 to Belmont Park. The Fall Championship Meet features 42 stakes worth more than $10.1 million, including six Breeders’ Cup “Win and You’re In” qualifiers held over two weekends in late September and early October. Family fun activities, live music after racing and other amenities will also be featured at the meet that runs through Sunday, October 29.